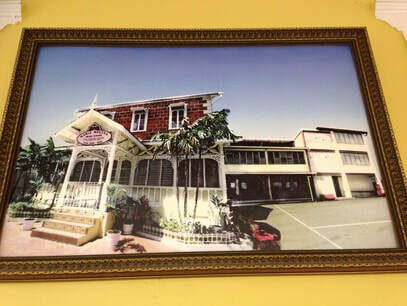 It is recorded that in the 1800's, a boy's school by the name of St. George's College was run on the ground floor of the building which housed the Archbishop of Port of Spain and which was later owned by the Sisters of St. Joseph of Cluny. This College was closed in 1858. The Sisters recognised the need for a school for young boys and as such, opened one on the grounds of the Convent. The school later became known as "MOTHER LYDIA'S SCHOOL". The school was a legend and heritage. It was named after Sister Lydia Aird, a Sister of the St. Joseph of Cluny, who, after her religious profession in December 1988, was immediately given charge of the boys' section of St. Joseph's Convent. There she remained in full control and undisputed right until 1965! As the girls' section of St. Joseph's Convent expanded, space was needed for extension and there was question of closing down the boys' section. Mother Lydia was very upset but recited many a Rosary (her favourite prayer) for a favourable solution of this threatened catastrophe. In 1963, a property across the road from the Convent on Aberbromby Street was purchased and renovated as a Junior School. It served two separate entities - a school for Mother Lydia's boys who would go to St. Mary's College and a school for the girls of pre-secondary level, who hoped to be admitted to St. Joseph's Convent. The Lord had intervened! Her boys were taken care of. Now she could say her "Nunc Dimitis". In 1965 Mother Lydia retired, but retained close and loving relations with her 'old boys' who gathered around her in 1949 to celebrate her Golden Jubilee of Religious Profession; in 1959 her Diamond Jubilee; and in 1964, her Ruby Jubilee! Then the Lord summoned her to her eternal reward. On 30th March 1967, Sr. Lydia gave back her sould to God in her 89th year. The two schools amalgamated in 1964 and in May 1967, registered as "Maria Regina Grade School". Since 1964 it has been under the able and devoted guidance of Sr. Mary Margaret Moloney, our first Principal, who has won herself the collaboration and esteem of teachers and parents alike. The children are prepared for the Secondary Entrance Examination (S.E.A.) and usually succeed in being admitted to the 'first-choice' schools. But more important than this, is the teaching of religion with the total all-round personal development and education of the child. This is a Catholic School with Catholic principles, activities and celebrations attended by the whole school. The young children are prepared for First Communion, participate in the celebration of the Eucharist and the reception of the Sacrament of Reconciliation. They are involved in extra-curricular activities - Cub and Brownie Packs and Singing, to name a few. The learn too, to be interested and concerned for the 'unfortunates' in our society - the handicapped, the blind, the deaf, the disabled; recipients of the assistance of the St. Vincent de Paul Society; the inmates of the Homes for the Aged and Destitute; the neglect for whom the Christmas season of rejoicing at the Christ's Birth would be but another joyless period were it not for the distribution of food, clothing and gifts by the pupils and Staff of "Maria Regina Grade School". After forty three years of dedicated service to the school, Sr. Mary Margaret Moloney retired in 2007. That very year, her hard work was recognised when she was awarded the Chaconia Medal (Silver) for 'long and meritious service to Trinidad and Tobago in the sphere of Education". She has been replaced by the former St. Joseph's Convent Port of Spain Principal, Mrs. Elizabeth Crouch, another award-winner as of 2007. Mrs. Crouch was awarded the Public Service Medal of Merit (Gold) for 'outstanding and meritious service to Trinidad and Tobago in the sphere of Education".